Details of Gargrave family from the Grewelthorpe area. The following research was submitted by Suzi Nottingham in October 2012. William Gargrave born around 1793 in Leyburn married Dorothy Wickill from Spennithorne on 12th February 1833, they had a daughter Ann baptised on 25 October 1833 At Mickley, buried on 4 November 1834. Dorothy was buried on the 7th April 1846. 1.Parish records of Grewelthorpe July 1849 describe William as the illegitimate son of Elizabeth Weighill, spinster – presumably Mary is also illegitimate. On the 10th November 1853 William married Elizabeth at the Register Office in Ripon and their first legitimate child George was born on the 26th December 1854 with another child Elizabeth Dorothy in February 1856 who died two months later in April. The 1861 census shows another daughter Ann born on 3rd September 1851 in Kirkby Malzeard, her birth certificate shows mother Elizabeth Weighill, Father’s name left blank. William died on the 8th July 1855 before the birth of his last child. I think it is fair to assume that he was the father of Mary, William and Ann and then decided to marry Elizabeth – perhaps his conscience told him he should! The 1861 census has Elizabeth as head of the household – a widow and charwoman – living with her were William, Ann and George. In 1871 she is housekeeper to a William Jackson. Her son William is living in the village – a boot and shoe maker and Anne his sister is living with him, a dressmaker together with their Aunt Mary Austick. 1881 William is still in Grewelthorpe still a boot and shoe maker but married to Ada with children Alfred 6, Anne 4 and John William 1. Elizabeth died in 1889. Suzi would be interested in knowing if anyone is researching this family. I am descended from the only legitimate one! George Gargrave was my great grandfather – he came down south and joined the navy. The following history has been done from census returns. Updated March 2013. ADA ANN GARGRAVE. Born C1910.Huddersfield. Dau of John William & Hannah. Married in 1938 to Stanley Dyson. in Huddersfield. ALFRED GARGRAVE. Born C1875 Kirkby Malzeard or Darlington.?. Died in Croydon in 1944. Son of William & Ada Priscilla. In 1891 he was a shoemakers apprentice in Kirkby Malzeard. In 1901 he was a Carman Contractor in Kent. Married to Louie from Essex. They had baby son Louis born in Beckenham Kent. In 1911 he was a coachman in Surrey. He had had 6 children and 1 had died. ANNIE GARGRAVE. Bap. 24.12.1876. Grewelthorpe. Dau of William [shoemaker] & Ada Priscilla. DOROTHY GARGRAVE. Died April 1846. Buried Kirkby Malzeard. ELIZABETH GARGRAVE [nee WEIGHILL]. Born C1820 Spennithorne. Dau of John & Anne Pace. Married to William in 1853. she was a widow & a charwoman in 1861.
see her grave after Williams entry. ELIZABETH DOROTHY GARGRAVE. Bap 16.3.1856 . Buried 21.4.1856. Grewelthorpe. Dau of William & Elizabeth. FRANK IREDALE GARGRAVE. Born C1911 Huddersfield. Died 1983. Son of John William & Hannah. Married in Halifax in 1937 to Edna South. of Gargrave. married  to Dorothy Newsome. of Gargrave in 1951. GEORGE GARGRAVE. Born C1772 Wensley. Married Ann Dent. Father of William George Gargrave. 1793 – 1855. GEORGE JOHN GARGRAVE. Bap.16.3.1856 Grewelthorpe. Son of Wm & Elizabeth. In 1881 he was a stoker aboard HMS Euryalis. A 3rd class iron corvette cased in wood. stationed in Bombay Harbour. East Indies. He was unmarried. In 1911 he was a Naval Pensioner, stoker in Royal Navy. Living in Portsmouth. he was married [ In C1883] to Margaret Stubbington. of Portsmouth. They had had 6 children. 1 died. [Mabel, Marguerite, George & Dorothy worked in a corset factory]. HERBERT GARGRAVE. Born C1906 Surrey. Son of Alfred & Louie. JOHN WILLIAM GARGRAVE. Bap. 22 June 1879 Grewelthorpe. Killed WW1.see notice below. Son of William & Ada Priscilla. In 1911 he was a tramway conductor in Huddersfield. Married C1909 To Hannah of Sowood Hill. They had 2 children. Ada Ann & Frank. JOHN WILLIAM GARGRAVE. Born C1902 Surrey. Son of Alfred & Louie. MARY GARGRAVE. Born C1848. Dau of William & Dorothy?. In 1861 living in York. MARY VICTORIA GARGRAVE. Born C1884 Portsmouth. Dau of George & Margaret. WILLIAM GEORGE GARGRAVE. Born C.1793 Wensley. Died 8.7.1855 Kirkby Malzeard. Married 12.2.1833 Dorothy Wrighill?/Wickill. of Spennithorne. Married in 1853  Elizabeth Weighill. Lived in Grewelthorpe in 1851. 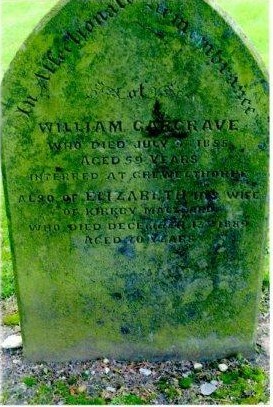 Grave of William Gargrave 1793-1855 & Elizabeth in Kirkby Malzeard. Thanks to Suzi Nottingham for this picture. WILLIAM GARGRAVE. Born C1850 Grewelthorpe. Son of William & Elizabeth. he was a shoemaker. Married to Ada Priscilla of Northallerton.